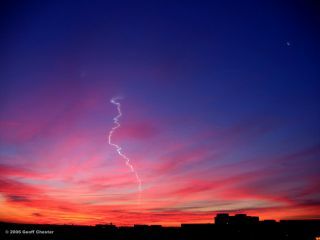 This Minotaur rocket launch from Wallops Island in December 2006 was photographed by Geoff Chester in Alexandria, Virginia. UPDATE forJune 28, 6:12 p.m. EDT: As feared, bad weather thwarted the first launch attempt of a Minotaur rocket carrying the ORS-1 satellite. The next launch try will occur Wednesday (June 29) at 8:28 p.m. EDT. NASA plans to launch a new military satellite from a Virginia spaceport late Tuesday (June 28), a flight that could potentially create a spectacular sight for skywatchers along the U.S. East Coast. The U.S. Air Force's Minotaur 1 rocket is slated to blast off from a NASA launch range at the Wallops Flight Facility and Mid-Atlantic Regional Spaceport at 8:28 p.m. EDT (0028 GMT). The mission: To launch ORS-1, a Department of Defense satellite built for the Operationally Responsive Space Office. ORS-1 would be the Operationally Responsive Space Office's first working satellite. The spacecaft is considered an "important step to demonstrate the capability to meet emerging and persistent war-fighter needs," NASA officials said in a statement. It is also expected to support the military's intelligence, surveillance and reconnaissance needs by hosting an innovative sensor system. Weather is a key factor for Tuesday night's launch. Currently, forecasts predict a 30 percent chance of good launch weather for the planned sunset blastoff, Wallops officials said. A NASA map available here shows the likely ranges of visibility for Tuesday night's launch. This chart displays areas that have the possibility of seeing the ORS-1 Launch after launch on June 28, 2011. Should clear weather prevail, the four-stage Minotaur 1 rocket will lift off on Tuesday during a three-hour launch window that closes at 11:28 p.m. EDT (0328 GMT Wednesday). An 8:28 p.m. EDT launch would closely coincide with sunset along the Atlantic coast. Located just south of Assateague Island, Va., NASA's Wallops Flight Facility is on Wallops Island and is home to a multi-user spaceport located on Virginia's Eastern Shore. Tuesday's planned evening launch would mark the fourth attempt to launch an orbital rocket from this coastal Virginia range in the past 4 1/2 years. Over the years, similar rocket launchings have routinely taken place from California's Vandenberg Air Force Base. Rocket launches that have occurred around the time of sunrise or sunset have left long, glowing contrails in their wake that have been seen for hundreds of miles across California's southwestern desert. While many West Coast residents may be quite familiar with such launch sightings, they are very rare in the East, and as such may end up surprising millions of people if the Minotaur 1 launches Tuesday night as planned. Illustration of the ORS-1 satellite, an operational prototype, scheduled for a one to two-year mission. The rocket will be launched on a southeast trajectory and should be visible, depending on cloud cover and one's viewing location, in the eastern U.S. from southern New York to North Carolina. It may also be seen as far west as West Virginia and much of Pennsylvania. By looking at the rocket's projected path as well as using previous Minotaur launches with similar orbital trajectories from Wallops Island as a guide, I have determined that at the moment of the third stage burnout, about 3 1/2 minutes after launch, the rocket will be situated about 100 miles (160 km) east of Wallops Island and at an altitude of 67 miles (108 km). That works out to a potential radius of up to 1,000 miles (1,600 km), suggesting that Tuesday's post-sunset launch might be visible from even greater distances — perhaps as far north as southern Maine, as far south as northeastern Florida and as far west as eastern Kentucky. The key to making a sighting is to have a clear, unobstructed view of the horizon in the direction of Wallops Island. For example, a viewer in Raleigh, North Carolina should look toward the northeast; in Providence, R.I., you should face southwest; in Pittsburgh, Pa., it'll be in the southeast. Areas near and along the immediate Atlantic coast have an advantage since skies will be darker and sunset will arrive earlier than it will for inland locations to the west. Should the launch occur on time,for places to the west/away from the Atlantic coast ( where the sun will still be up), it is debatable whether the light from the rocket or its accompanying exhaust plume will be readily seen against the blue daytime sky. In contrast, if the launch is delayed by roughly a half hour to an hour, the background twilight sky will be darker, but the the Minotaur 1 won't climb into sunlight until about a minute or two after liftoff. The exhaust plume would then be illuminated by the sun and may create a nice eye-catching display, becoming gradually contorted by high-level winds into strange and exotic corkscrew patterns and, possibly, prismatic colors. The first two stages of the Minotaur I are decommissioned Minuteman intercontinental ballistic missiles, while the two upper stages utilize Pegasus rocket motors, built for the U.S. Air Force by Orbital Sciences Corporation. "This vehicle has spent most of its life in the nation's defense, and the level of confidence we have in this vehicle is quite high," Jay Pittman,chief of the Wallops Range and Mission Management Office, noted prior to the first Minotaur launch from Wallops Island in December 2006. "It is something that has flown many, many times." More than 250 invited guests, including Pentagon representatives and state and federal officials, will travel to Wallops to view the launch, NASA Wallops Flight Facility spokesman Keith Kohler said. The latest weather forecast for Wallops Island for Tuesday night calls for scattered thunderstorms, suggesting that there could be a launch delay or postponement. NASA Wallops officials will provide status updates on the launch here. You can also call theWallops launch status line at 757-824-2050, or listen to the NASA Radio Station 760 AM for details. NASA will provide a live webcast of the launch here, with audio updates on the radio station WCTG, 96.5 FM.